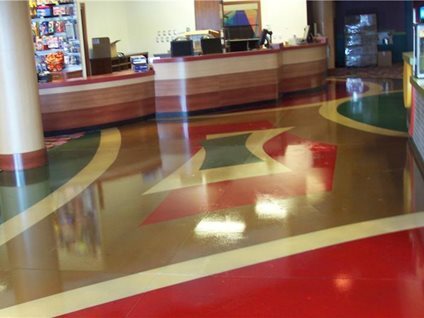 If you want to completely change the color of a concrete floor, there are a variety of products you can apply topically to achieve opaque or semi-translucent color effects. While these products are sometimes called concrete “paints,” they are really dyes or water-based acrylic stains formulated specifically for concrete. Don’t be tempted to use the same paint you would use for walls or other surfaces. Because of concrete’s porous nature, they are likely to peel, especially when applied to concrete slabs on grade (see Repair Tips for Peeling Paint). True concrete stains and dyes breathe so any moisture within the concrete doesn’t get trapped beneath the surface, causing the topical color to blister. Find out how concrete floors make it easy to match your new floor to your existing decor. If you want to achieve more subtle, semi-transparent color effects, tinted sealers are a good option. They provide all the benefits of a sealer while serving as a stand-alone, low-cost coloring method. They can also be used to color-correct or enhance existing colored concrete. Both solvent- and water-based sealers can be tinted, depending on what you are trying to accomplish. Learn more: Tinted Sealers What Are They? If you are considering “painting” a concrete floor with a penetrating stain or dye, be aware that some color variation is likely to occur. Ask your contractor to prepare a sample of the color you have in mind so you know exactly what to expect. Also ask to see color swatches and photos of finished jobs to help you decide on the best colors for your project. 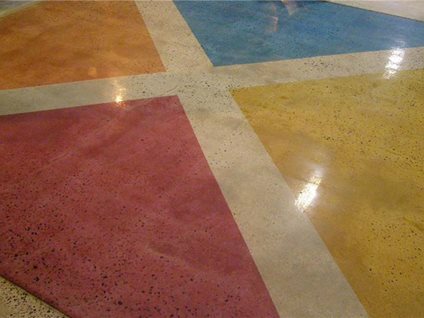 Be aware that concrete floors to be stained or dyed must be free of existing coatings, sealers or curing compounds. Otherwise, the color will be unable to fully penetrate and bond to the concrete.